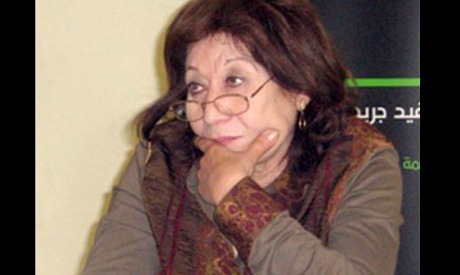 On 6 January, the Egyptian culture scene lost one its highest pillars, Nehad Selaiha, a woman who holds a unique place in the world of theatre and among generations of theatre practitioners. Her presence was so strong no one really thought about her being among the primary colours of the artistic landscape until her departure left the picture skewed – and so it will remain for a long time. 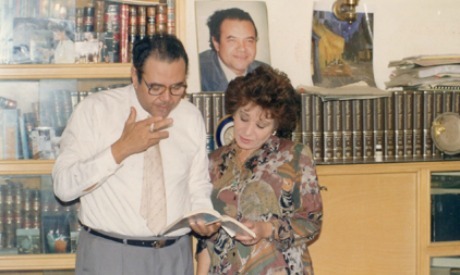 A bilingual scholar, translator, historian, writer and critic – her English reviews of Arab productions gave pages of Al Ahram Weekly an indispensable depth and value for years on end – Selaiha had boundless energy and depth. Her multidisciplinary approach to theatre is demonstrated in dozens of books she authored or contributed to, hundreds of articles she wrote and as many prestigious seminars and juries she led or participated in. But beyond her numerous awards and accolades, Selaiha was above all a theatre aficionado, a promoter, mediator and mentor who discovered, encouraged and supported hundreds of young theatre makers. A true “theatre activist”, as she was widely known, Selaiha saw the theatre as a kernel for creative energy, freedom of expression and human development. For decades we could always find Selaiha wherever theatrical practice took place: enjoying the comfortable seats of a well-equipped hall or barely balanced on a wooden chair in the corner of some simply lit fringe venue. Selaiha never minded sitting on the floor, surrounded by young followers and genuinely happy that a given space was full. Minor events were as important to her as large festivals, and big city lights captivated her with the same strength as the dark alleyways of provincial towns. Selaiha attended every stage of the creative process: performances, rehearsals, readings, discussions of scenography and lighting. She observed, listened and proffered her advice; and how inspiring she was when she spoke of the theatre’s magic, often with actors and directors. During performances, her laughter occasionally broke the silence of the auditorium, her enthusiastic applause was received with an almost juvenile pride by scores of young theatre makers, all of whom she treated as her own children. Then we would await her review, yet another experience in which the production became the nucleus of a much broader historical, social, political, philosophical and human discourse. When Selaiha wrote about theatre it was as if she was creating profound and lucid paintings; she was, in fact, telling stories about life. Indeed, for Selaiha, theatre was the life she shared with everyone around her, as she navigated with ease the network of passion, academia, people and complicated hierarchical structures. And it was thanks to her omnipresence and boundless dynamism that she could keep watching new generations take the stage, but time never stood still and the effort – the many difficulties and disappointments, too – began taking their toll on her health. 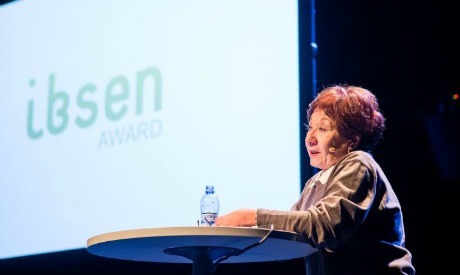 Born in 1945, at a tender age Selaiha wanted to become a theatre actress. “It was through Shakespeare that I had my first lesson in theatre when I played Shylock, then Rosalind in secondary school. When later, at university, I played Desdemona and Hermia, my lifelong bond with theatre was sealed,” Selaiha writes in her essay “Reconstructing the ‘Local’: A Personal Perspective”, part of a book entitled The Local Meets the Global in Performance, edited by Melissa Sihra. Selaiha went on to study English literature at Cairo University, obtaining her MA from the University of Sussex, UK, in 1969, but she stayed close to theatrical circles partly through her fiancé (and later her husband) Mohamed Enani, who at the time co-edited Theatre magazine; Enani was to become not only the renowned translator of Shakespeare, Byron and Pinter to Arabic but also a major scholar, writer and critic who translated Arabic literature to English as well. The arts and humanities at large became Selaiha’s life, feeding her passion for theatre all the more: she became a regular at the Music Library where Jean Sibelius’ Symphony no. 1 made a strong impression on her. On the other hand, she would remained intellectually indebted to philosophers such as Sartre, Camus and Kierkegaard; Nietzsche in particular spoke to her, making her “separate ethics and metaphysics,” as she put it. In the mid-1970s, Selaiha returned to Shakespeare, briefly teaching Shakespearean drama at King Abdulaziz University in Jeddah, Saudi Arabia, but by the late 1970s she was already teaching criticism and drama at the High Institute for Art Criticism – the position through which many of us first became aware of her – moving in and out of Egypt while she earned her PhD in drama from the University of Exeter, UK, in 1982. Finally settling in Egypt in 1984, she was offered tenure at the institute, of which she became dean in 2001-2003. “Being on stage remained a passion with me throughout my life although I couldn’t become an actress, and so teaching offered me a sort of a substitute,” Selaiha revealed in a 2013 interview for Ahram Online: “I enjoy teaching because, for me, it’s like being on stage, I have the floor, I teach drama, I can act all the parts I like… I have a captive audience.” And indeed Selaiha took her role as educator to a highly theatrical level – in the best sense. “There was everything but routine in Nehad’s lectures,” Maissa Zaki, a theatre critic and practitioner and one of Selaiha’s many students-turned-friends, recalls the time she spent in her class. Alongside her teaching, Selaiha had already been sharing her knowledge even more broadly, writing about theatre in Arabic in Theatre magazine and, once it became available, in English in Al-Ahram Weekly, but also elsewhere throughout the world. Her passion was contagious. She generated interest and won the hearts of the young since, though she was interested in all forms of theatrical expression, she had a strong belief in independent troupes, which to her were the platform for truly free creative expression and boundless experimentation. In 1990, when the dynamics of independent theatre changed, she was a main character in the drama. In her comprehensive article “25 years of independence”, published in Al Ahram Weekly’s issue of 14 April, 2016, she wraps up that moment: “On 23 August 1990, a group of theatre artists, critics and activists met at the Acting Professions Union in downtown Cairo to protest the decision of the Ministry of Culture to cancel that year’s edition of the Cairo Experimental Theatre Festival due in September on account of the Iraqi invasion of Kuwait. In this historic meeting the idea of the independent theatre movement as a ‘third way’ (to borrow Eugenio Barba’s phrase), or alternative to both the state and commercial theatres was born. The historical event, as Selaiha explains, led to the First Free Theatre Encounter [aka. Festival] in 1990, followed by the second Free Theatre Festival at the Al-Taliaa state theatre, in 1991, and eventually a strong independent movement housed by the newly opened Al-Hanager Arts Centre that has been gaining momentum ever since. Selaiha’s article opens as a mere report of the facts, through which she underlines important milestones reached by the independent pioneers. With typical humility, she refrains from mentioning her own crucial role in helping to unify many dispersed voices into a theatrical movement. It was the kind of thing that she did expecting nothing in return – her mission, which she was never to give up for one day till the end of her life. “In 1988, Dr Nehad attended a performance I directed with student colleagues at Cairo University,” director Tarek Said recalls his earliest beginnings. “A few days later, to our great surprise, we found an article praising us, published in the Arabic press. Us, young students, not linked to any state theatre, experimenting on stage, on the pages of a magazine! This was beyond any expectations or dreams. The rest was like a snowball; we found ourselves part of the bigger movement, surrounded by troupes coming from all across Cairo and the provinces. While Selaiha was the dynamo, she neither promoted her presence nor took credit for it.” Said explains how Selaiha set everything into motion. Selaiha’s involvement in the independent scene expanded as she became its best mediator. “Everyone, starting with our generation which entered theatre in the early 1990s, had his own special relationship with her,” the director, scenographer and playwright Mohamed Abul Soud explains, pointing to the many instances when Selaiha reviewed his plays, negotiated their staging with censorship authorities and fought for other young creators. In many instances, what gave her strength was her well established academic status and respect from her colleagues in state institutions and across many cultural venues. With diplomacy she always managed to turn those assets to the benefit of independent theatre makers. “It was very hard to say ‘no’ to Selaiha,” Hoda Wasfi, the director of Al-Hanager Arts Centre from its inception until 2012, revealed. “She always stood behind young people. I remember a few instances when for different reasons, I could not host a specific performance or I did not have a sufficient budget. Selaiha would come to my office with a series of arguments why we should give this play a chance and would come up with budget solutions. She always found her way to convince us,” Wasfi comments with warmth, adding how Selaiha would go to many locations, open the doors to creators, push them to work, develop and remain strong as a collective creative force. And, whatever its kind, it is this strong sense of responsibility that Selaiha felt for the theatre movement that made her very different to all other academics and for which she has become a major pillar of what this scene is today. The dynamics that exist in Egypt’s independent theatre today, more than 25 years after “the historic meeting”, are but a continuation of a path already laid by the previous generations. Even if today’s theatrical expressions seem different to those of the past two decades, and they reflect different contexts and perceptions, they remain but the new – and fresh – branches of a creative tree, planted in the 1980s, and duly watered by Selaiha through the years. With her constantly young and fresh spirit, even in the last years of her life, Selaiha always welcomed novelty, change and experimentation, new theatrical formats and vocabulary. 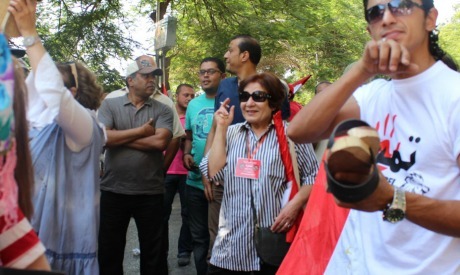 She was happy to capture those novelties on many occasions, with an article she wrote in Al Ahram Weekly on 29 December 2011, titled “A Year of Revolutionary Theatre” being one such testimony. She kept challenging decision makers through the years. She was the one to fight vigorously for the young as well as speaking for the whole scene. Selaiha was the main voice demanding the return and revamping of the Cairo International Festival for Experimental Theatre (CIFET) which had been suspended in 2011. Last year, in 2016, she was finally able to see that happen when CIFET returned as the Cairo International Festival for Contemporary and Experimental Theatre. As she watched and documented, just as before, she looked to the future with her hallmark optimism. Director Essam El-Sayed agrees that her reviews were “always down to earth – she analyses and encourages, remains balanced and never overly emotional while she helps us understand our emotions. She has depth without needlessly complicating things. It is a very unique skill.” Even during the final weeks of her life, Selaiha continued attending performances, documenting the history of Egyptian theatre, analysing trends and developments, setting them in larger contexts and speaking about the vibrant multidisciplinary relations between the many phenomena. She taught us arts, culture and life, presented international theatrical practices to Egyptian readers and spoke about Egypt to an international scene. As a theatre critic, to Al-Ahram Weekly readers, Selaiha offered hundreds of stories that varied from reviews to elaborate analyses of a theatrical movement. She could dedicate an entire article to a director, a playwright or an actor, but she could also invite the reader on a journey that touched on the broader creative, societal and historical aspects of a given work. At times she could even step beyond the known canons of theatre criticism, and open her article with a frustration triggered by the removal of a tree from the theatre’s courtyard, or describe the large staircase she had to conquer when visiting the offices of Fawzy Fahmy, CIFET’s former president. For Selaiha, even those seemingly trivial and unrelated components, were part of her life in the theatre. 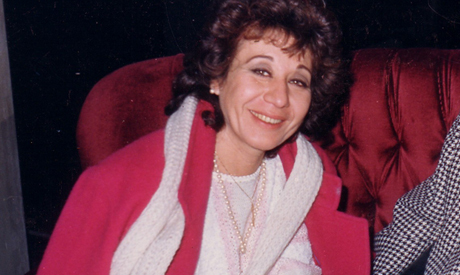 Throughout her academic career, she continued creating vibrant links between her passion, Egyptian theatre and the international scene, for which she received numerous awards and recognitions handed to her at many local, regional and international theatre festivals including the Sharjah Festival, the Gulf Cooperation Council Festival, the Carthage Festival, the Amman International Theatre Festival, and the Doha Arab Theatre Festival in 2012. In November last year, she received the prestigious award in the field of arts and literature from the Kuwait Foundation for the Advancement of Sciences. In Egypt, Selaiha received recognition from the Cairo International Experimental Theatre Festival (1996), the State Award for Superior Achievement in Literary Studies (2003), the State Appreciation Award for Arts (2013). Many publications wrote about Selaiha, while the 2 January 2017 edition of Masrahna (Our Theatre) magazine dedicated its issue to her. Her contribution to the cultural field had, after all, been extended through her membership of the High Committee for the Theatre at the Supreme Council of Culture, and at the Drama Committee of the Production Department for Radio and Television. She was also at the board of directors at the Roberto Cimetta Fund to Support Young Theater Artists in the Euro-Med Region. But all this is but a tiny part of the story, for much of what Selaiha achieved in her life cannot be quantified. Not one person who crossed her path was unaffected by her unique spirit, wisdom or genuine passion to support and encourage. We all mourn the loss of a great scholar, critic and a mentor. While the void is irreplaceable, we are also left with the many gifts Selaiha bestowed upon us. Her writing will remain with us, but more importantly her presence will live on in our hearts – thousands of godchildren.